I am originally from Hawaii, where solar panels and solar power are not a new concept. Growing up, we always used solar water heating, unless the day was rainy or cloudy. The state is one of the biggest users of solar energy, and has the second highest state tax credit (behind Louisiana) for solar power installation. According to the National Renewable Energy Laboratory, fossil fuel-fired power plants account for 40% of man-made carbon dioxide emissions. Moving away from fossil fuels, whether that’s done by installing solar panels on your home, your apartment building, or your office building, reduces the emissions of greenhouses gases like carbon dioxide and nitrous oxide. To truly make progress in changing how our electricity is generated, it’s best to take steps yourself and to do the installations as well as lobby, show support, write letters, and other activist activities. This is because the utility companies are most likely to be using fossil fuels such as coal, natural gas, or oil. The biggest difference is made by stopping your own consumption of fossil fuels in conjunction with pressure on utility companies and local governments to make changes. Doing one or the other makes a difference, but not as much of a difference as the two together. This number is just an average, and it’s just what’s released from purchasing electricity from your local utility company. Keep in mind that this number does not include the other ways that a household can leave a carbon footprint, such as transportation, heating, and food and product consumption. Even the location of your household makes a difference in your carbon footprint and its size. Planting a single tree removes 0.039 metric tons over its lifetime, but installing solar panels is the equivalent of planting 171 trees each year over the life span of your solar panels (about 20 to 25 years). Although solar power isn’t the only way to reduce your carbon footprint and the carbon footprint of your household, you can still make a big difference in carbon reduction (and your pocketbook) by making some switch to solar panels. Electricity and transportation are the two largest contributors to a household’s carbon footprint. Yes, it does add to carbon footprint to purchase a few solar panels, as their manufacturing does add something to greenhouse gases. However, solar panels pay for themselves in just a few short years. In less than two year, they are carbon negative, as their savings makes up for what it added to the atmosphere upon its creation. According to Home Power magazine, manufacturing a 100-watt solar panel produces about 960 pounds of CO2. But, in the 20-25 year life span of that solar panel, you offset 8,400 pounds of CO2. Those numbers compound when you install several on your home, apartment building, or office building. The panels also pay for themselves in about four years, with the money you save in using a renewable and cheaper energy source. We’ve all heard of the ill effects of global warming: summers are hotter, ice sheets melt, ocean levels rise, blah blah blah. These consequences may seem like things that won’t affect us for another 100 years, but that’s not entirely true if we don’t make any changes now. By cutting our carbon emission levels, the impact is much larger than decreased pollution and reducing our dependence on foreign oil. 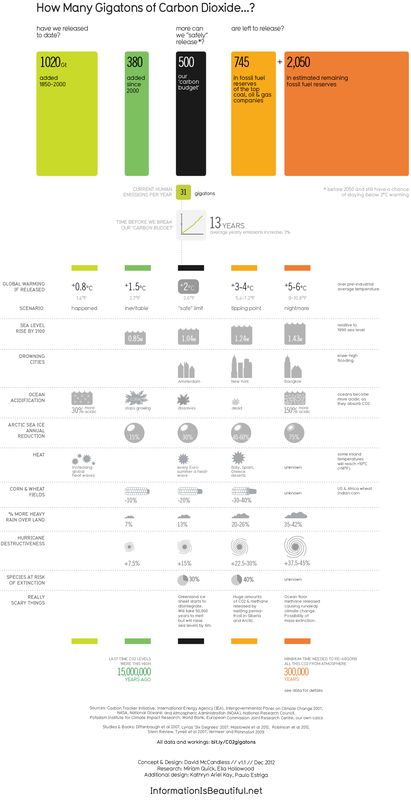 This infographic from Information is Beautiful shows you why we need carbon reduction now, and why the consequences of global warming (some you may not even know about) aren’t as far away as we may think. Of course, this infographic presumes that will maintain, or even increase, our current levels of carbon emissions, which further demonstrates that small changes can make a big difference.